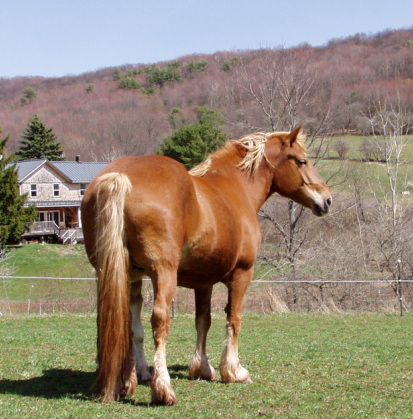 High Meadows Farm has sadly retired from breeding horses. Though we are a small breeder, each one is important to this critically rare breed. Our hope is that there will be someone out there to take our place. We are very pleased with the great new homes the breeding stock horses have found! 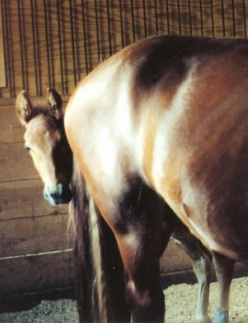 One of our foundation mares, we bought Rosa as a weanling from the Baileys of Brattleboro, Vermont. She produces such lovely offspring that we kept two of her daughters as broodmares. Her fillies from 2004 and 2006 (High Meadows Summer and High Meadows Rosamina) were exported to England, where they have successfully competed in hand and in harness, and are starting their careers as broodmares. Rosa has given us 10 beautiful foals, the last born in April 2010, and she is now retired and living the easy life. Poor Otis was born early and his mother didn't have enough colostrum in her milk, so he "crashed." He spent a while at Cornell, and then came back to the farm to be nursed back to health. As a result, he is crooked. His hind legs just aren't exactly where they should be, so he can't do any pulling, and only very light riding. I suppose he does actually "pull his own weight" around here by being a good pasture buddy for the stud colts when they start realizing who they are and have to be separated from the mares and fillies. Otis is always entertaining with his plethora of quirks and we are quite happy to be stuck with him.